Previous PostSix Word Story #4Next PostMy crazy is still sane. Girlfriend, don’t we need flint stone? Heck, I have no clue. I forgot the beginning of my thought. Wait till you are 63. You get no time to remember anything. 63 is a long way! I’m 40 years away. By then, I’ll be glad if I could learn to write as well as you do! Haha! Yes, I can understand. I love these pebbles. When dry, they look all bland, grey and boring. Water works magic on them. That itself is so fascinating! 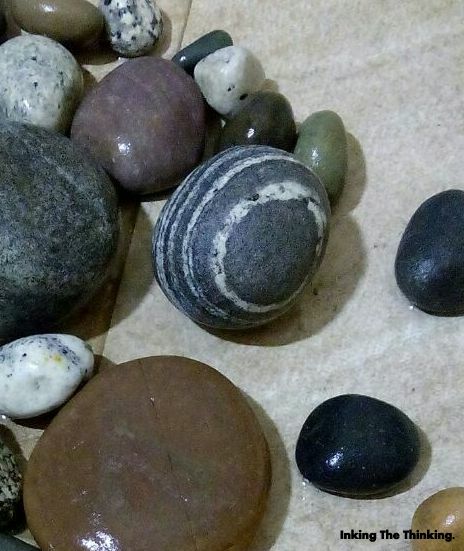 These pebbles take such beautiful colours when wet, you have to see it to believe it! Hahahha yeah. That’s what you say to little children. “Awww its ok. You are unique and special in your own way. You might have some hidden talent that kid doesn’t”. If you think your stones are flint, then strike them against steel. At the risk of sounding stupid, how do I really know if they’re flint? I tried asking them. They didn’t respond. Come to think of it, they usually don’t talk back. Well, if you don’t want to become an amateur geologist, you could strike them against steel and see if they make sparks. (Sorry if my logic is a bit recursive). Strike the steel at an angle.